The Kosynier boardtrack might look every bit vintage from the outside but on the inside its components tell a different story. An electric engine concealed behind an antique-looking body makes this bike look like a stylish motorcycle from the early twentieth century. Built by two brothers – Marcin and Michal Bielawski Kosynier – they are the founders of Kosynier, a Poland-based manufacturer driven by their interest in historical vehicles. They grew up in their grandfather’s smithy where they learned the basics of metallurgy. Inspired by a childhood-turned-adolescence surrounded by classic cars, old Polish motorcycles, and even a 1965 Mustang Convertible, the idea to create a vintage product was something that came naturally. The vehicle is classified as speedbike/moped, which means that in the European Union it can drive with the maximum speed of 45 km/h. The company offers the possibility to order custom-made Kosyniers, with vintage-futuristic design. That means if you have a particular idea of how your bike should look like or you have a vintage or a contemporary car, the Kosynier designers can draw for you a bike based on your car’s design. 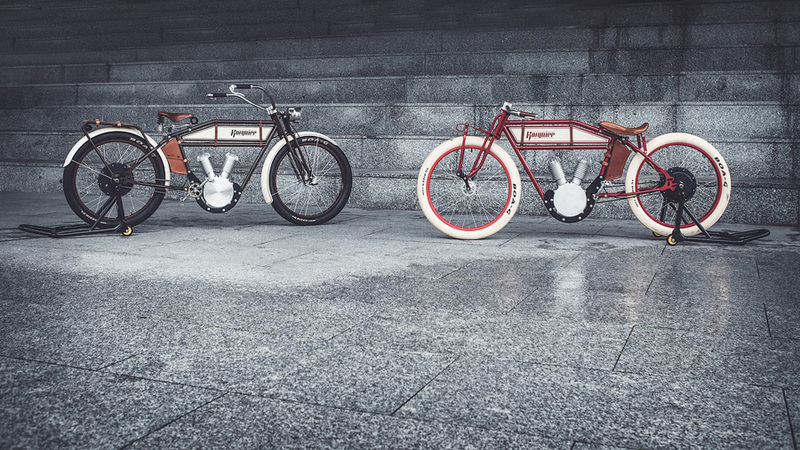 And after viewing this vintage bike you should definitely check other vintage bikes White Phantom Motorbike by Kingston Customs and Steve McQueen’s 1915 Cyclone Motorcycle. Are they for sale in the u.s.